Yesterday when I came to the office I received an email telling me about a funeral being held that morning for the 2-year old daughter of a former Cabrini Connections student. The message came from the volunteer who began mentoring that youth in the mid 1990s and who continues to this day --- more than 15 years later -- to still be a mentor in the life of this youth and his family. I went to the funeral. It was tragic. The minister said "nothing I say can make sense of this tragic death" but "God has a purpose and maybe this death brings us together and changes our own life direction". While he was addressing the family and friends of this young man and his wife, he did not realize he was also addressing the Cabrini Connections family. I had not talked to this volunteer in more than a year, or to this young man in about the same length of time. At the funeral saw, and talked with, others who had been part of Cabrini Connections, or the Montgomery Ward/Cabrini Green Tutoring Program prior to 1992. I'd not seen many of these young people for many years, but have been making an effort to reconnect via Facebook and our Linked in pages. Maybe this tragedy will be the catalyst that gets more of our former students and volunteers reconnected to our current students and volunteers and each other. Mentoring is not about reading, writing, test scores, and teacher-directed tutoring. It's about relationships that form because a program like Cabrini Connections is available in the neighborhood, and creates an introduction during one year, that we hope lasts for a life time. Well organized tutor/mentor programs support the match between youth and adult, with the goal that they last for additional years so the bond between young people and volunteers, and the organization, grows and remains supportive as everyone grows older. Once in Cabrini Connections, aways in Cabrini Connections. I've been saying this for many years. I mean it. Being at this funeral and giving support is just one small example of they type of support mentors can give to youth, and each other. Recognizing that these young adults, who were in elementary school or middle school when we first met them, still need our support for them, and for their own children, is what this community is really all about, and why we need donations from people who read this blog or visit our web sites. 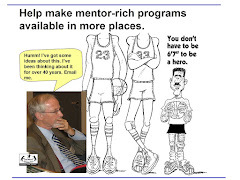 January is National Mentoring Month. As you make your New Year's Resolution I hope you'll read the blogs we write, and learn more about this long-term form of mentoring, and ways that you, your church, your family and your business can support it in 2009 and beyond. 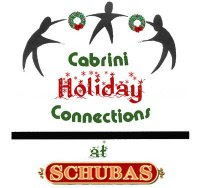 You can make a donation at http://www.cabriniconnections.net/donate if you want to help us continue this work in 2009. "Poke beneath the surface of any shooting on that weekend of April 18 and you will likely uncover a tangle of social woes that only an entire city, as a whole, can do much about. The police can clean up mess after mess, but more messes will be coming along." If you click the links to the left on violence, or media, you’ll find that this is not a new story. 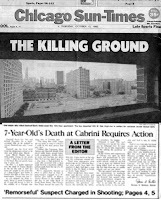 In fact, as the front page of the October 15, 1992 Chicago SunTimes shows, the media have been calling for public involved in solving this problem for a long time. So why is so little happening? What’s the opportunity that was missed in today’s editorial? I did not read anything in the “Stop the Killing” report that suggested strategies for getting people who don’t live in poverty personally engaged so that they use their time, talent and resources to make life different for those who do live in poverty. Yet, that’s what can happen when volunteers join structured, volunteer-based tutor/mentor programs like Cabrini Connections, or many others that you can find in the Program Links section of the T/MC web site. I encourage you to read some of the volunteer profiles from Cabrini Connections. As you skim the web sites of some of the other tutor/mentor programs from Chicago, you’ll see similar stories. If we can increase the number of business volunteers connecting with kids in tutor/mentor programs, we can increase the chances of fewer kids growing up as gang-bangers, and more kids growing up and becoming contributing members of society, perhaps even a future President. I want to thank the Chicago SunTimes for writing these stories. I’d also like to thank them for making a $2 million award to the SunTimes Judge Marovitz Lawyers Lend A Hand Program in the fall of 2006. Money from that award was distributed as $240,000 in operating grants to 31 different tutor/mentor programs in 2007 and another $217,000 in grants in 2008 (even though the stock market dive has seriously eroded the original $2 million award). As we enter 2009 there will be more killings and more opportunities for the media to write stories calling on the public to build long-term strategies to bring hope to the hopeless, and an end to the violence. I hope that each time the paper writes a story about violence and poor schools, it will point to the Tutor/Mentor Connection web site, and our database of Chicago area programs, where people like Pete Kadens can get involved, and stay involved for a long time, in helping change the future for kids born into concentrated, segregated, inner-city poverty. I hope they also point to the articles on our web site that readers can use to build their own understanding of these issues, and to be more involved in helping comprehensive, mentor-rich volunteer-based programs grow in inner-city neighborhoods. 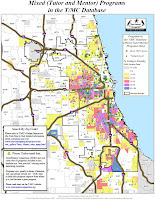 Finally, I also hope they will use the maps in the Tutor/Mentor Map Gallery, to encourage business, hospitals, colleges and faith groups to become strategically involved in all of the areas where they do business or have facilities, not just a few high profile places, or a few pilot programs. If there is one media story and reference to volunteer-based tutor/mentor programs in a major newspaper of Chicago each week for the next five years, there will be an army of volunteers like Pete Kadens, and a growing support system to prevent some young people from growing up to become involved in “gang-related” killings on Chicago streets. If our business, faith, and political leaders point to programs in neighborhoods where they do business, on a weekly basis, they can help this network of programs and army of mentors grow, and stay connected to kids for many years. Can this happen? That's my wish for 2009. Help me make it come true. The Tutor/Mentor Connection (T/MC) is attempting to create a "community of practice" as defined in this article by Etienne Wenger. The T/MC community consists of every organization listed in the Links Library and Tutor/Mentor Program Locator, as well as people who are linked in each of the web sites we point to. It also includes anyone we reach via email newsletters, or participation in on-line forums. It's a galaxy of people and organizations connected by a gravity of common purpose. We all want to help kids born in poverty connect with adult support systems that result in kids finishing school and starting jobs/careers by their mid-20s. I encourage you to read the article by Etienne Wenger and use your understanding during 2009 and beyond to help us connect members of this community to each other. 2017 Editor Note: I've updated the link to Etienne Wenger's blog to a more recent article since links to the 2008 story are lost. The December 19, 2008 edition of The New York Times included a public service advertisement showing President-elect Barack Obama encouraging readers to "Be the change: mentor a child." The advertisement is a call to action from ServiceNation and National Mentoring Month partners - The Harvard School of Public Health, MENTOR and the Corporation for National and Community Service - and is timed to coincide with January's National Mentoring Month activities. The call to action also is benefiting from the leadership of Be the Change, Civic Enterprises, City Year, and the Points of Light Institute. Newsweek magazine has also agreed to print the Obama ad pro bono, and additional publications are being approached to do the same. See the full New York Times story. On the National Mentoring Month web site, a section points to 10 Things You Can Do In January. Number 10 is Make a Donation to a Mentoring Program in your Community. I'd like to see the nation get a jump on the January campaign by emphasizing point Number 10 in December, when donors are making holiday gift decisions and year-end tax decisions. Without building the funding infrastructure of volunteer-based mentoring and tutoring the PR campaign will send new volunteers into battle as ill equipped as we've sent soldiers in war in Iraq. Furthermore, I'd like to encourage people from around the country to think of the meaning of the charts and maps on this blog. What are all of the ways we need to work together, using our time, dollars, talent, and the leadership of people like President-Elect Obama, to create a infrastructure that would support on-going, mentor-rich programs in high poverty neighborhoods of every city in America? We can't find this solution until we get more and more citizens involved. With President-Elect Obama's commitment to service, and out-of-the box thinking, we have a great opportunity. On Wednesday, December 18, 2008, twenty-seven outstanding Chicago-area tutor/mentor programs were awarded $217,000 in grants at the annual Grant Reception of the Sun-Times Judge Marovitz Lawyers Lend-A-Hand to Youth Program (LAH). The reception at the Chicago Bar Association (CBA) was attended by program leaders and volunteers as well as judges and other members of the legal community. The CBA originated the program in 1993 to impact the lives of underprivileged youth through tutor/mentor programs, and the program benefited from receiving substantial funds from the late Judge Abraham Lincoln Marovitz and The Chicago Sun-Times. The money will benefit over 2,500 Chicago-area young people from neighborhoods including Cabrini-Green, Albany Park, West Town, Humboldt Park, Logan Square, Austin, Belmont-Cragin, Rogers Park, , Hermosa, Uptown, Edgewater, South Chicago, Pilsen, Lawndale, Little Village, Garfield Park, Englewood, and Washington Park. Programs serving youth in the surrounding suburbs of Palatine Township and Evanston also received awards. Read more and see the complete list of programs receiving grants. 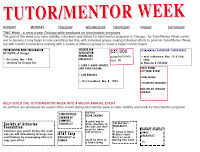 The Tutor/Mentor Connection has been a proud partner of this vision since June of 1994 as part of an on-going strategy aimed to draw volunteers and operating dollars on a consistent basis to volunteer-based tutor/mentor programs in every high poverty area of Chicago. In 1994 when the T/MC first began working with the Lend A Hand Program, the only grant was the Thomas A. Demetrio Award of Excellence, which included a $2,000 grant. The first winner was the Ariel Education Initiative, led by Arne Duncan, who is now the new Secretary of Education in the Obama Administration. One of the strategies we launched with the Lend A Hand Program was a Tutor/Mentor Week. Initially this was planned during the week of the November Conference so it could help us draw participation. 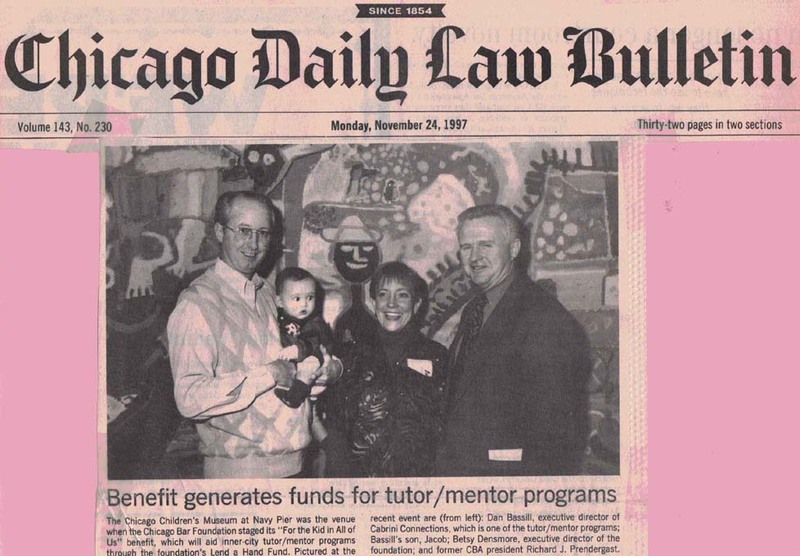 At the same time the Chicago Bar Foundation and Lend A Hand launched a November benefit, which by 1999 was attracting nearly 1700 attorneys and friends. This photo was from one where my son Jacob was a guest. 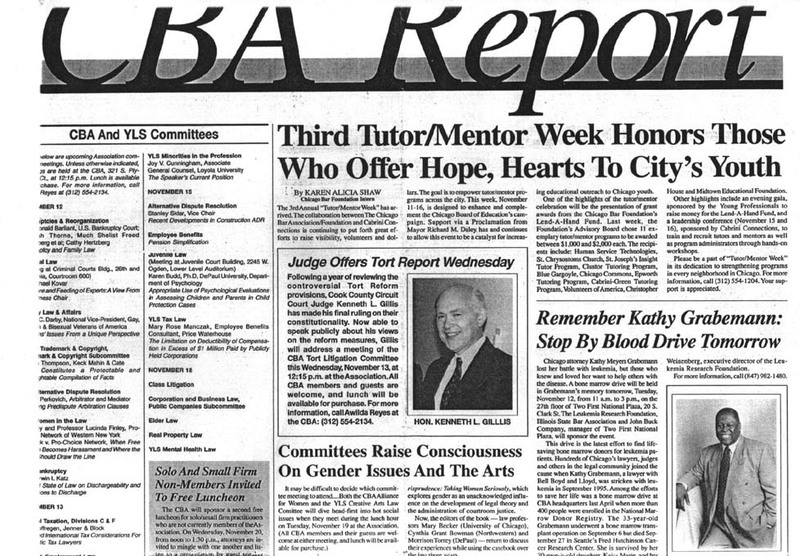 As a result of these events the Daily Law Bulletin featured front page stories about the event, the Lend A Hand and the Tutor/Mentor Connection. At the same time we were generating news coverage in local newspapers, radio an TV, thus building greater frequency of stories drawing attention to volunteer-based tutor/mentor programs and the intermediary groups that were supporting them. This is one headline from the Law Bulletin. Our vision is that law groups in every major city duplicate what the Lend A Hand Program is doing, and that leaders in other business sectors, faith communities, and civic, social and alumni groups, also duplicate this. The result will be a diversity of volunteers and of funding supporting tutor/mentor programs and K-12 youth, in a growing number of high-poverty areas of Chicago and other cities. This vision can be a reality if you share information about Lend A Hand Grants with leaders in your own industry, and/or your own community, and if leaders like President Obama and Secretary of Education Duncan, give attention to business support systems like this in their own leadership activities. In 1994 when we began working with the Lend A Hand Program our vision was that our partnership could raise hundreds of thousands of dollars each year and that 80% of that money would be distributed to volunteer-based tutor/mentor programs throughout the city. The other 20% would be split to fund the operations of the Lend A Hand Program and the Tutor/Mentor Connection. Because of a $2 million award from the Chicago SunTimes to the Lend A Hand Program, this vision is now becoming a reality. 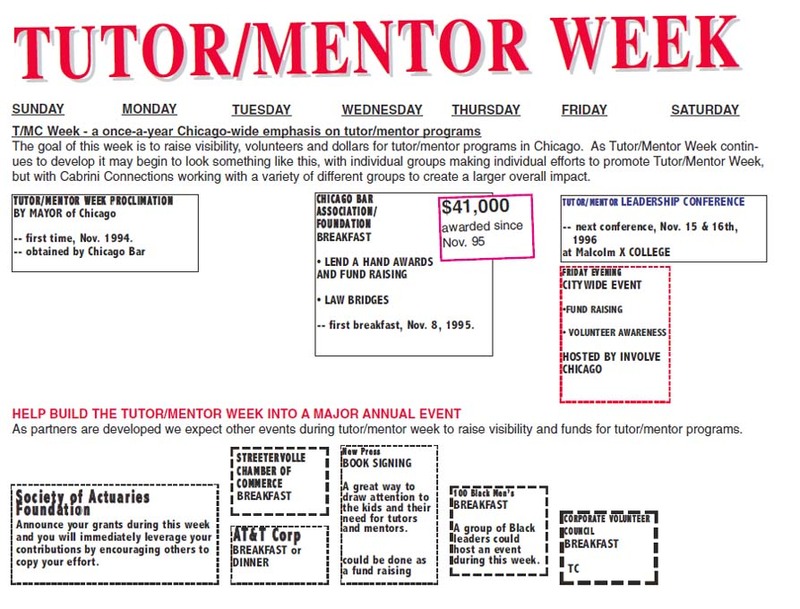 Among the grants to tutor/mentor programs in Chicago was a $30,000 grant to the Tutor/Mentor Connection. We need your help to sustain this program. Giving donations, bequests and other charitable gifts to the Lend A Hand supports Cabrini Connections, Tutor/Mentor Connection, and many other tutor/mentor programs in Chicago, just as much as giving gifts directly to these programs helps cover 100% of their operating and innovation expenses. As Judge Thomas Donnelly said when announcing the awards, "We wish it could be two or three times as much." With your help, and donations to Lend A Hand, the donation pool can increase, meaning larger grants and more support for tutor/mentor programs throughout the Chicago region. Today Arne Duncan, CEO of Chicago Public Schools was named to be the new Secretary of Education in the Obama administration. Congratulations. We wish you well. Readers of this blog can Google Arne Duncan's name today and find literally thousands of stories and commentaries like this and this. I've known Arne Duncan since 1994 when he attended a Tutor/Mentor Conference in his role as Executive Director of the Ariel Education Initiative. 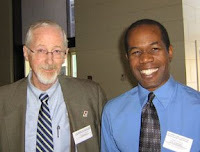 I met with him the year prior to Paul Vallas leaving CPS, and exchanged an email discussion about support for the Tutor/Mentor Connection just the week prior to him being named CEO of Chicago Public Schools. He's given small grants to support Tutor/Mentor Leadership and Networking Conferences in the past (2003, 2004, 2005), but has never taken on the leadership and advocacy role I feel we need from the public schools leader to make comprehensive, career focused, volunteer-based tutor/mentor programs available in every high poverty neighborhood, and around every poorly performing school. So, I've put in three graphics I hope he'll point to over the next four to eight years. Hopefully, he will show them to President and Mrs. Obama, and they will champion these concepts as well. The first shows three time frames in which kids need learning opportunities. The third time frame, after 5PM, evenings and weekends is when business volunteers are more available and more likely to make weekly commitments that last for many years. This does not mean that business volunteers and donations are not needed at schools and Boys & Girls Clubs during the school day, and right after school during the 3pm to 5:30 pm time frame. This second graphic shows the same three timeframes, but on a chart that reinforces the need for learning supports and mentoring, starting in preschool and elementary school and staying connected to kids all the way through high school and college and into careers. In this graphic, parents, teachers, social workers, mentors, are all PUSHING kids to make good decisions that we know will help make their lives better. What we need is the partnership of businesses and universities who will use their resources (people, jobs, learning, dollars, technology, facilities) to PULL kids through school and into careers. When there are thinking teams in each industry, and in colleges, brainstorming ways to influence the decisions kids make, and the way the resources of the business and university are used to connect kids with non-school learning programs, there will be more leadership, and more good ideas, being circulated in more places. Generals use maps to position troops and supplies in their efforts to win wars. Obama is the Commander in Chief, and Duncan is about to become a 4-Star General. 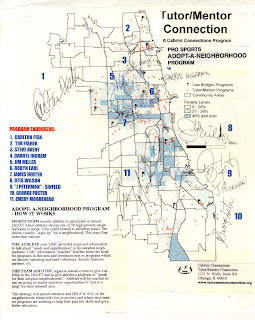 If they learn to use maps like these, to focus resources and strategies in all of the high poverty neighborhoods of Chicago and other cities, so that a wide variety of constantly improving, mentor rich, volunteer-based programs grow AT THE SAME TIME, in all of these places, then they can mobilize resources from businesses, hospitals, universities, faith groups, etc. and point them to places where they are needed. Finally, we don't need to reinvent the wheel. We don't need to build a new government in Iraq. We need to help existing programs already operating in Chicago and other cities get the resources, ideas, volunteers, leaders, dollars they each need on a continuous basis to operate in one or more of these places, building and sustaining connections with kids and volunteers, and each other, that build quality and impact at the same time as the PUSH kids through school and PULL them toward careers. Every city needs a Program Locator database to help volunteers and donors locate existing tutor/mentor programs and to help Generals understand the existing deployment of troops, and where reinforcements are needed. If our new leaders borrow some of these ideas instead of creating brand new ideas of their own, maybe they can make some progress over the next 8 years of winning this war. Along the left side of this blog are tags to maps, strategies, articles, and links that we hope the staff of these new generals will read and use as ammunition for the upcoming battles. If we're called upon, we'd be happy to serve as mentors to these leaders or to anyone else who wants to become more strategic in mobilizing and sustaining resources to help kids through school and into careers. Last Friday evening Mike Trakan, who works part time for Cabrini Connections, Tutor/Mentor Connection, and produces the maps on our blogs, showed he had another talent. He leads a Chicago area band called TRAKAN, which was one of four groups to donate their time and talent at a benefit held at Schubas Tavern. Mike's a quite guy at the office, but a wild man on stage! Mike wasn't the only member of the Cabrini Connections staff showing off talent on Friday. Chris Warren, our Public Service Fellow from Northwestern University, also is part of a band, called Howling Poppies. 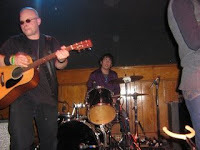 Chris is a drummer and not only performed with his band, but took on a Ringo Starr role with Mike's band. Chris and Mike originated the idea of a benefit concert a few months ago, as we all talked about how difficult the economy was going to make it for raising money for non-profits. They recruited performers from two other bands, Black Collar, and The East-Side Ramblers, a drums and sax jazz duo. While we raised a few dollars from this event, we also made some new friends, and found another reason to tell our story via the internet, so maybe we reach even more people who want to join us, or who have already been part of Cabrini Connections or the Montgomery Ward/Cabrini Green Tutoring Program in the past. For instance, in the bar at Shubas, I ran into one of our current volunteers, Allen Tyson and a former volunteer who I had not seen in almost 18 years, Jim Alexander. Allen and Jim were both part of the tutoring program at Wards when I was its leader, and an employee at the company. While Allen has been tutoring, and helping raise money, Jim has been receiving our newsletters, but had not gotten involved. Because of this chance meeting, he's now reconnected. By creating this presence on the Internet, we're connecting with other former volunteers. Last week I received a Linked In invitation from Joan Marcus who was an advertising copywriter and tutor at the Montgomery Ward program in 1979! She's now in PA and leading her own communications company. On my Linked In page I'm now connected to 54 of our former volunteers, dating back to the late 1970s. On our Facebook page we have 161 members, with 9 of them being former students dating back to 1973. We're building these connections with the help of volunteers and the talent of people like Mike and Chris who help draw public attention to our web sites and blogs. I hope you'll help us by making a holiday donation. See our eCard here, and our PayPal page, here. Yesterday I attended a forum hosted by the Chapin Hall Center for Children at the University of Chicago and the Urban Institute. 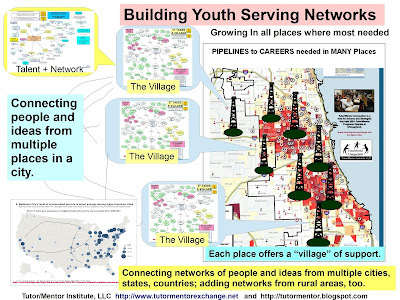 The title was "LOCATION, LOCATION, LOCATION: Combating Urban Poverty through Place-Based Initiatives. • Celena Roldan, director of child care, Erie Neighborhood House. 1701 W Superior St., Chicago, IL 60622. This session was broadcast as a webinar and potentially more than 1000 people were listening. The recorded session will be available on the Chapin Hall web site so hopefully many more people will find this and learn from what was presented. If you subscribe to their email list you can get notification of when this will be available and of future events. The speakers were each given a few minutes to offer their ideas, and each talked about how children living in places with high poverty face greater disadvantages and challenges than do youth in more affluent situations. Furthermore they all focused on the need for long-term solutions, and emphasized how difficult it is to evaluation community building efforts. Mr. Howard emphasized that donors and policy makers need to be thinking in 10 to 20 year time frames, rather than in 2-3 year grant cycles. In their summary comments, the speakers each encouraged collaboration, information sharing, capacity building, flexible funding, etc., but when I asked how they might envision President Obama using his internet army to connect and share information, to achieve these goals, none of the speakers seemed to have given this much thought. My first observation is that 90 minutes is too little time to share the depth of experience of these speakers. Second, the 20 minutes for Questions at the end of the event is too little time for an audience of more than 200 to ask more than a few superficial questions. In addition, I was disappointed that no one used maps to illustrate the range of places where poverty is concentrated. I would love to see these organizers build an internet platform on Ning or some other portal so speakers and participants could stay connected to each other in on-going idea-sharing and collaboration following the event. Classroom and Fireside Learning are two examples of connected communities. Social Edge is another example of the type of on-line community that could be encouraged. I posted links to speaker profiles so you can go to their sites and look at their research. There is much to learn. However, in the LINKS Library on the T/MC you can find dozens of additional articles related to poverty and place-based solutions. You can also find links to information that non-profits, businesses and foundations might use in supporting their own involvement. While yesterday’s event draws attention to new research and the problem of poverty, we need a comprehensive adult e-learning strategy, which engages more and more people in business, universities, philanthropy, non profits, and education with these programs. 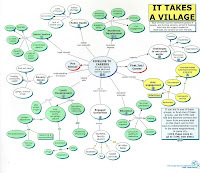 This village chart illustrates the many different sectors who need to be sharing their ideas and connecting in community problem solving. If you review the articles I’ve written over the past few years you can see that I am actively engaging in the type of network building that I feel is needed to draw a crowd attract volunteers, donors and policy makers, to the research created by the Urban Institute, Chapin Hall, and dozens of other places, as well as articles and blogs by many who comment on these challenges, and point to solutions. 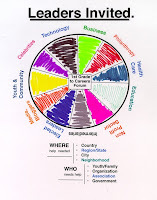 I’ve created forums for people to connect with T/MC and its network on Ning and at central web site hubs, like the T/MC http://www.tutormentorconnection.org site, but I’m also participating in forums hosted by others for the same purpose. So far I’ve not found any forum that consistently connects researchers, donors, business leaders, policy makers, etc, with a goal of creating understanding, sharing good ideas, and pointing resources to place based organizations who cannot put the ideas to work without consistent, on-going, flexible funding. The T/MC is not the only place where this type of information needs to be aggregated and we are a small non profit, and cannot facilitate the learning of this information the way a university or faith network might do. Just like there are millions of suns in the galaxy, each with stars connected to them by gravity, there needs to be hundreds of hubs drawing people from education, non profit, media, business, politics, etc. to this information, and pointing them to thousands of place based locations where kids need the type of help that volunteer-based mentoring, in many different formats, can provide. I’m hopeful that President Obama will draw on his community building skills, to engage more people in this learning process, in internet forums, and in place based activities. If President Obama creates an Issue Wheel, like the Boston Innovation Hub, and uses his weekly radio addresses and other public speaking opportunities, to encourage members of his on-line army of supporters to go through the issue wheel to find knowledge about issues, and lists of actions they can take to solve problems, along with maps and databases showing places where they can provide time, talent and dollars to solve problems, he could radically change the way people learn and work together to solve some of the problems we’re writing about. If public and private sector funding is made available, to organizations who organize this knowledge, and facilitate life-lone learning, understanding and actions, based on this information, these funds would be leveraged by the time, talent and dollars that people contributed to implement the ideas they learn in all of the places where concentrated poverty is a costs to society, and a tragedy to individuals and families. We don’t know yet what the new president will do, but each reader can do something now to make a difference. I encourage you to seek out a tutor/mentor program and make your donation before the end of 2008. You can help change the pattern of poverty by how you help kids connect with mentors, and knowledge, and education and jobs. 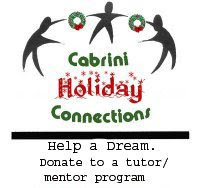 If you want to help Cabrini Connections, Tutor/Mentor Connection, click here. While we held the fall Tutor/Mentor Leadership and Networking Conference on November 21, the networking following the conference is continuing in many areas. I've posted the welcome remarks by Dr. Clinton Nichols of the Field Museum on our Ning page. I've also posted photos from the conference on the conference web site. We're now doing what most other non-profit organizations do at this time of year, which is sending fund raising appeals to potential donors. I hope you will download our Holiday Fund Brochure and consider a donation, or forward it to others who might help us continue this work in 2009. 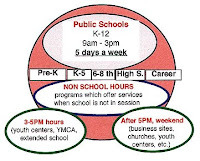 Strengthening Out-Of-School Time Non Profits - A Marketing Problem? I received two studies this week which I hope readers will take time to look at during the coming month, so that in 2009 you can share these with your network, and expand the number of people who work to implement the recommendations. The first was titled Strengthening Out-Of-School Time NonProfits: The Role of Foundations in Building Organizational Capacity. This study, by Heather B. Weiss and Priscilla M. D. Little of the Harvard Family Research Project, describe seven organizational challenges of the Out-Of-School Time (OST) non profit sector. (d) developing and implementing a sound sustainability plan. (a) Will the grants made by non profits give them the organizational supports needed to achieve their program goals? 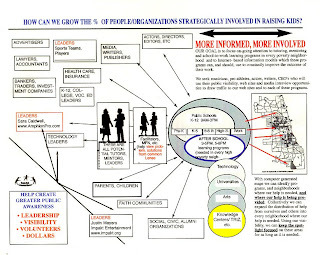 (b) What internal capacity do foundations need to build to create organizational strength at the non profit level? (c) Is a grant portfolio too heavy on program innovation at the expense of organization building? (d) Are grant makers close enough to the non profits they fund? While this paper gives us lots of knowledge for building stronger organizations the second paper helps us focus our thinking on ways to have stronger organizations in all of the places where they are needed. This is titled, The Enduring Challenge of Concentrated Poverty in America. “The Enduring Challenge of Concentrated Poverty: Case Studies from Communities Across the United States” explores how pockets of extreme poverty emerge and persist in communities. 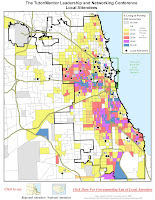 Concentrated poverty is found to occur in a variety of social and economic contexts that imply the need for tailored strategies to ensure a better future for these communities and their residents. Common features are identified for the 16 communities that were studied. This report was created by The nation’s Federal Reserve Banks, in conjunction with the Board of Governors and the Brookings Institution. 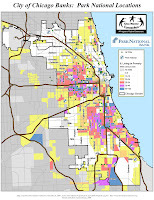 While concentrations of poor people living in poor neighborhoods have been observed in large Northeastern and Midwestern cities, concentrated poverty also exists in smaller cities, immigrant gateways, suburban municipalities, and rural communities. The need for a deeper understanding of the relationship between poverty, people, and place led the Federal Reserve to join with the Brookings Institution’s Metropolitan Policy Program to create this report. It contains case studies, undertaken by the Federal Reserve’s Community Affairs Offices, of 16 high-poverty communities across the United States. The report is available online at http://www.frbsf.org/cpreport/. As you read these reports, I urge you to keep this chart in mind. It shows three time frames when we can connect with kids, which are the school day, right after school from around 3pm to 6pm, and right after the work day ends, from after 5pm to 8pm. It also shows that the time line from first grade to a career has some people who PUSH kids to do their best, which includes non profit organizations, parents, teachers, etc. What the research on poverty shows is that in some places, kids are not being pushed by enough people who can influence aspirations for diverse jobs and careers, or who can help connect kids to these opportunities as they grow up. Peer and community models influence different, sometimes more negative choices, as kids get older, which leads to the high drop out rate for high schools in areas of high poverty. The report by the Harvard Family Research Project focused on community foundations, and other private philanthropy. The T/MC chart focuses on the business community who we feel needs to be more strategic in using their resources (people, ideas, technology, facilities, jobs, dollars) to PULL kids from first grade to a career. This is the "pipeline" that I hear so many talking about, but so few people actually supporting. Our final graphic is a map of Chicago. 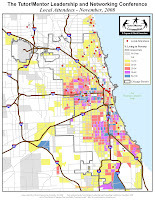 This highlights the high poverty areas of Chicago, and locations of poorly performing schools. These are places where strong OST programs, including volunteer-based tutor/mentor programs are needed. It's great that the Federal Reserve Banks supported the poverty study. We hope that means they will build strategies that mobilize and distribute needed resources in all of the places shown on the map as needing strong non profits, in partnership with community foundations, public funding and the kindness of many strangers. I encourage you to view the other map articles in this blog to see more examples of how maps can be used to support business, church, university and hospital involvement in different neighborhoods of Chicago. This strategy could be applied in any city, perhaps with leadership from the Federal Reserve Banks themselves! The OST report had an emphasis on benchmarking and networking. I consider every organization listed in the T/MC database and Links Library to be part of our network and each time we post a message we are inviting members of our network to connect with us in on-line discussions, as well as face to face meetings, so we build stronger relationships and a greater personal and organizational knowledge that leads to stronger non profits helping youth through school and into jobs and careers in all of the places around the country where such programs are needed. 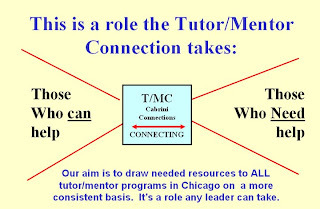 As people read this, I hope you take a personal role in strengthening non profit tutor/mentor programs, by sending a donation to Cabrini Connections, Tutor/Mentor Connection, or to one of the other organizations listed in the Chicago Program Links. Today was the second School Policy Luncheon held at the Union League Club in Chicago, and organized by Catalyst-Chicago. One of the speakers was Michael E. Woolley, M.S. S., Ph.D., University of Chicago, SSA. During the first event, held in November, Charles Payne, author of “So Much Reform, So Little Change,” and Penny Bender Sebring, founding co-director of the Consortium on Chicago School Research provided information that illustrated how schools in high poverty areas which have high levels of social capital perform better than similar schools with less social capital. In this presentation Sebring described social capital in two ways. Bonding Capital is the connections made between people within the community to each other. It happens when people attend faith services, go bowling together, and through other group interactions. Bridging Capital is what connects youth and families within a community with people and experiences beyond the neighborhood. Catalyst-Chicago has posted live recordings of the November event, along with the presentation materials used. This is a great resource and I encourage you to use it in building a better understanding of the ways tutor/mentor programs expand 'bridging capital' and 'bonding capital' in inner city neighborhoods, and how that impacts school performance. In today's presentation, Dr. Woolley presented evidence showing that the more social capital and positive adults involved in the lives of inner city kids, the more likely that they will do better in school. I did a search on Google to find out more about Dr. Woolley, and saw that he had been quoted in an August 2008 Chicago Sun Times series about the impact of violence on the performance of kids in school. "Small world," I said to myself. I created maps and wrote about this article on this blog. I hope to connect with Dr. Woolley, and other researchers and advocates, in order to make this evidence known so that funders will begin to spread dollars to school and non-school solutions, and will evaluate volunteer-based tutor/mentor programs based on their ability to create and sustain relationships between inner-city youth and volunteers from beyond the neighborhood, rather than trying to align the work of these programs with classroom learning and the extended school day. If you know of such people, or if you're trying to build a similar case to support volunteer based tutor/mentor programs, let's find places to connect, such as the T/MC web site, or the T/MC ning site. If you're a person looking to make a major donation, why not use it to support non-school tutor/mentor programs in inner city neighborhoods, instead of building another building on a college or hospital campus. On November 19, 2008, I was honored to be one of five Chicagoans to be recognized as a 2008 Local Hero by Bank of America. This is part of an international Neighborhood Excellence Initiative® . In each major market Bank of America recognizes five Heroes who "who champion causes vital to their communities., inspire others to get involved, and who have special and significant impact on individuals, families, or communities." In addition to the award, each Hero was able to designate a charity to receive a $5,000 donation. I chose Cabrini Connections, Tutor/Mentor Connection. Ray Dowdle, who has been Chairman of the Board of Directors, and my main volunteer support for the past 16 years, received the award on behalf of Cabrini Connections. The photo shows myself (far right) and Ray Dowdle, (second from the left). At the far left is David J. Rudis, Illinois President, Bank of America, and to my left is Steven McCullough, President and CEO of Bethel New Life, who presented the Hero Awards. In his opening comments Kenneth D. Lewis, Chairman, CEO and President of Bank of America, reaffirmed his confidence in the US economy, and his company's commitment to supporting the non profit sector by saying, "while other companies give in-kind donations, our in-kind donation is cash". For non profits who are facing uncertain philanthropic support, that is a strong message of support. It's an honor to receive recognition like this for the work we do. I was humbled as I listened to the acceptance speeches of the other Chicago heroes. None of us are able to lead an organization unless many other people are willing to provide time, talent and dollars to support our visions, in countless ways and for many years. Thus, I offer thanks to all of you who have help me and Cabrini Connections, Tutor/Mentor Connection. In January 1994 we launched our first survey to determine who was operating volunteer-based tutoring and/or mentoring programs in Chicago. 120 programs responded and 54% said they had little or no contact with peers. 70% wanted more contact and 90% said they would come to a conference if it were at low/no cost and fit their schedule. So in May 1994 we hosted the first Tutor/Mentor Leadership and Networking Conference. It was attended by 70 people and the speakers and display table hosts were leaders of tutor/mentor programs who we had discovered from our survey. There was enough positive response that we hosted a 2nd conference in November 1994 and 200 people attended. We've been doing this every six months since then and the most recent conference was on November 21 at the Chicago Field Museum. The map to the right shows the addresses of organizations participating in the Nov. 2008 conference. Some organizations sent multiple participants. Not all of these are tutor/mentor programs. Some are people interested in starting programs. Others are people with skills or knowledge they wanted to share. The map shows participants from all parts of the city, but much fewer from the South part of the city and the suburbs. This map shows organizations that participated in the May 2008 conference. If you compare the two maps you'll see that some of the same organizations attended both conference, but we had quite a few more organizations from the North part of the city at the November conference, and more from the downtown, Near North area, at the May conference. Participation from the South part of Chicago and the suburbs was low at both. Below we show a third map, this time with locations of poorly performing schools, and locations of about 140 organizations who offer combination tutor/mentor services. This map shows that there are less tutor/mentor programs in the South part of the city, which may account for lower participation at the conferences. However, our aim is to attract people who want to start programs, not just those who already operate them. In the Mapping for Justice blog, we post maps showing the distribution of pure mentor, and pure tutor programs, in addition to combined tutor/mentor. 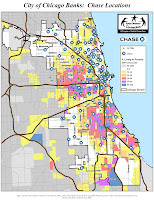 We also show maps of businesses, hospitals, colleges, and faith groups, who could be working together in different neighborhoods to help programs start, and grow to becoming world class operations. On the conference web site we've posted these maps, along with insets that show the participating organizations from the Chicago central city area. I've invited staff at Cabrini Connections to write blog articles that describe the conference and I've also invited others to write about their participation. You can find links to Nicole's blog, Chris's blog, Vjeko's Blog and others, on the Tutor/Mentor Connection Ning.com page. On the conference web site there is an attendee list which you can scroll to see who attended the conference, and to make contact with these people. Our aim is that the conferences energize the tutor/mentor movement and draw new resources to all of the programs in the city. 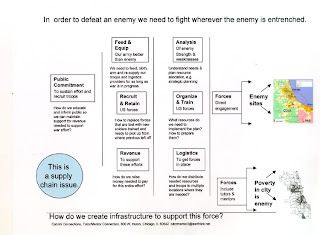 This strategy is described in a pdf titled "Creating a Network of Purpose", which is one of several strategy essays you can find in the Tutor/Mentor Institute section of our web site. As we head toward the year-end holidays, I hope that readers will encourage friends to look at the list of participants and chose one or more to send a donation so they have fuel to do their work in 2009 and beyond. 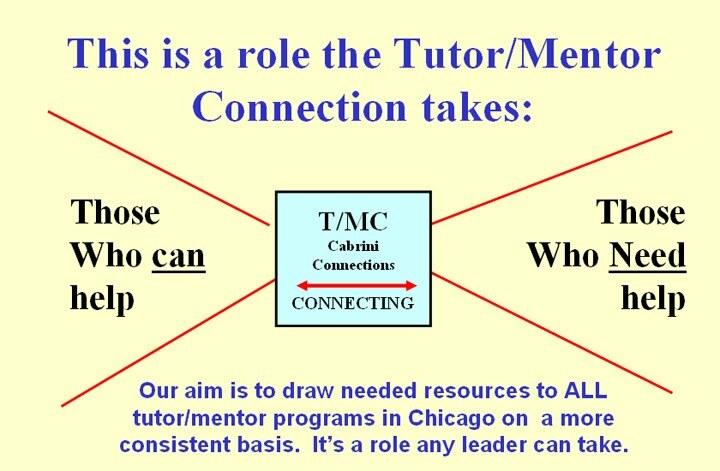 If you'd like to learn more about how to create a Tutor/Mentor Connection in your own city, or how to connect your strategies with the T/MC in Chicago, please contact us.